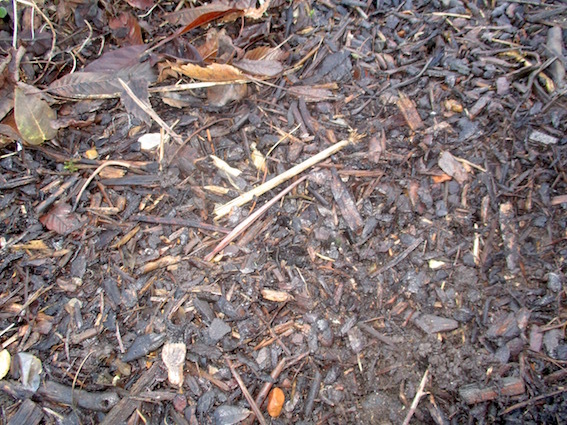 Mulch is a thin cover on the soil surface. Mulch gets thin cover in the horticultural press too. Reporting is very shallow. You probably know that mulching makes plants grow better, conserves water, looks good, insulates the soil and can suppress weed. You might add that it protects the soil from erosion in heavy rain and keeps the mud splashes off the strawberries. For many gardeners that is sufficient but you won’t get away with so little today. As is my wont, I want to dig deeper! Except I don’t dig. A perceptive student once inquired why as I am so keen on minimum cultivation I don’t just put a mulch on top of the soil and get a cavalcade of further advantages. He was right of course, it was a very shrewd insight. Although I have often rather snidely declared that the main advantage of mulching is to prevent the over enthusiastic gardener disturbing the soil it might actually be true. As I so often promote the benefits of none cultivation I will spare you that today! The actual properties and gardening merits vary with the material. The very best for water conservation are gravel and stones. Include in this list larger rocks and un-cemented paving. How often do you hear that clematis likes a ‘cool root run’ under stones. Partially true. The active principle is that loose stones and gravel do not intercept water and even light rain nearly all penetrates through. Like most mulches, as intended, they do reduce direct evaporation from the surface. Permeable plastics and substances such as polythene add to the list of good water conservers. Mulches are usually fairly long lasting surface materials although those such as bark and wood shreddings need topping up every few years as they slowly degrade. Discuss with the rabbits and moles the permanence of stone chippings. We also use the term mulching to include surface organic materials such as farmyard manure and garden compost. In actual fact these materials are usually intended to be incorporated by the worms and only remain at the surface for a while. Manure mulched rose beds annually topped up might last the whole year. Lawn mowings and Autumn leaves are perhaps a half way house in this crude classification. Mulching as a very effective means of adding organic matter is not really my subject today. Other than plastics, mulching against existing established perennial weed is almost useless. The weeds will love the mulch as much as the plants. We will say nothing about gardener’s attempts to smother perennials with newspaper and cardboard! Against weeds coming from seed mulch’s measure of control is really quite useful. It seems to be generally agreed that mulches need to be about two inches thick to stop weed seed germinating. This cover will be enough to suppress light levels at the soil surface to inhibit germination and enough to prevent emergence of small seeds. It won’t help very much with seed that blows onto the surface or is shed in situ (shame on you). In my own case the thinness of my wallet reduces the thickness of my mulch. My weeds are well enough controlled by my glyphosate spraying and I actually want many of my garden plant to sow themselves around. (This is why my mulches never overlay plastic - I want my garden plants to self seed). People tell me that weeds that do sow themselves in mulch pull out very easily! This year I newly mulched a large part of my borders with bark. This was to pacify Brenda who can’t stand the liverwort! The freshened up borders looked very nice. 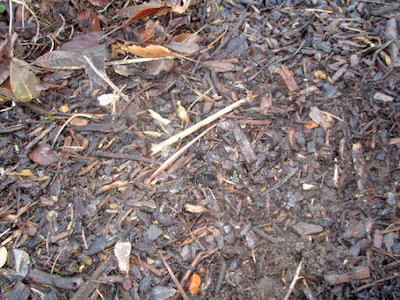 In general a mulch’s insulation might be thought to be a good thing if it keeps soil warm in Winter and cool in Summer. Not all mulches are insulators and plastics are only thin layers. Some colours are good heat absorbers and/or emitters. The relationship between day and night temperatures might be just as significant as those between seasons. It might for example be a difference between crop failure and success if night air above mulch is too cold and fruit blossom is frost damaged. It is really quite complicated - what do you want? If a Winter laid mulch keeps the soil colder this might be thought to be a bad thing. On the other hand if my frost delicate Dicentra spectabilis emerges a little later I will be very pleased. In practice in normal UK conditions I ignore potential exceptions, lay mulches at almost any time of the year and in terms of heat transfer hope they are beneficial! *In my earlier post about gravel mulching a lady wrote in that in her tropical climate gravel got too warm in the hot Summer sun. I must say that on our subsequent holiday in Costa Rica I did not notice this effect on the weeds growing in the hotel’s gravel roads! On the other hand the dry sand on the beach was too hot to walk on. I imagine in such climates the soil is much cooler under stones and although hot for a plant to clamber over keep roots happy? *A neglected exploitation of mulch’s insulation is putting an extra layer over dormant tender plants such as dahlias in Winter. The mulch might even be extra soil! This year we had five months of spectacular colour of dahlias overwintered in the ground - it had been a very mild Winter. 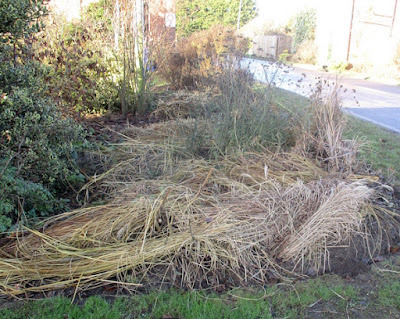 To increase my chances next year I have carefully folded over the large frost-dead tops of the dahlias and supplemented that with a layer of my miscanthus prunings and scattered amongst it mole soil from the lawn! I will remove it all in March! It does look a mess but the dahlias are worth it. I have only limited hopes for my effort! Insulation might be successful if Winter cold comes in short sharp spells. If we get a prolonged period of penetrating frost there will only be a very small benefit. With only a very small heat source from deep soil my mulch will be of very little value in stopping the soil freezing. As an analogy in our extreme 2010 Winter the inside of my unheated greenhouse was as cold as outside. Your own Winter coat only keeps you warm because of the heat from your body. Blog sleuth and myth buster Robert Pavlis writes about this phenomenon when he tested soil insulating cones. The best insulation for your dahlias is to plant them very deeply at original planting! *When I went to see Peter he showed me the graphs he had drawn when he wrote his PhD thesis. They showed how soil surface temperatures fluctuated throughout a sunny Summer’s day. It is really quite astounding. Most mulches would dampen such fluctuations although thin plastics might increase them. 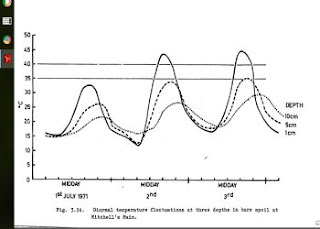 Drawn by hand before computer graphics, Peter measured soil surface temperatures on successive Summer days. My old Head of Department, a soil scientist, contended that mulches contributed very little to soil water conservation and I used to argue that they did. I thought before finalising this section I would have a word with soil scientist Peter Williams and found that he was not very enthusiastic either. He emphasised that never-the less he thought mulches in the round were a very good thing. He went on to mention that he had recently assessed the soil moisture under the mulch in his garden after heavy rain that had followed a dry period and found that very little water had penetrated through. Mulches reduce water evaporative loss from a soil surface but they sometimes intercept rain before it can penetrate in. At that point I scrubbed my text for this section and started again! I think a key attribute of a water conserving mulch is that it should let water pass through without soaking it up! I have long argued that none absorptive materials such as gravel and to a lesser extent coarse bark act like a one way valve for light rain that otherwise would evaporate away. A significant thing to understand is that an un-mulched wet soil surface becomes dry very quickly in drying weather. It rapidly becomes its own mulch in terms of water retention and soil surface evaporation stops. It will start again only when the soil is re-wetted and in the case of light showers the water will be very soon gone. Gardening books will correctly tell you that the best time to put on a new mulch is when the soil is already very wet. I put this to Peter and he explained that although the water retained by such a mulch would be a very useful equivalent of perhaps half an inch of rain that this was not very much in relation to the soil’s total available water content. Leaving gravel and plastic aside, I think a mulch’s greatest contribution to soil water relations might be to keep the soil surface ‘in play’ in dry weather. When a dry un-mulched soil has reached the stage of ‘self mulching’ it is dry several inches down. 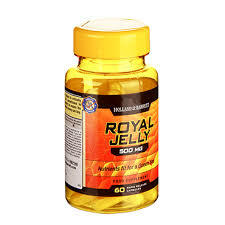 In that zone root water absorption and such as mycorrhizal activity will temporarily shut down. Considering that the most fertile soil is usually at the surface this is not a good thing. 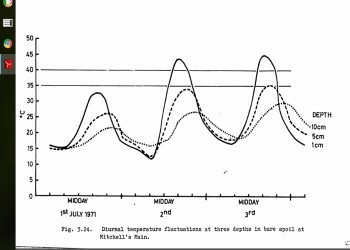 Peter added that such dry surface soil can also get harmfully hot on a warm Summer’s day (see his graph). Cosmetic value - disguise. 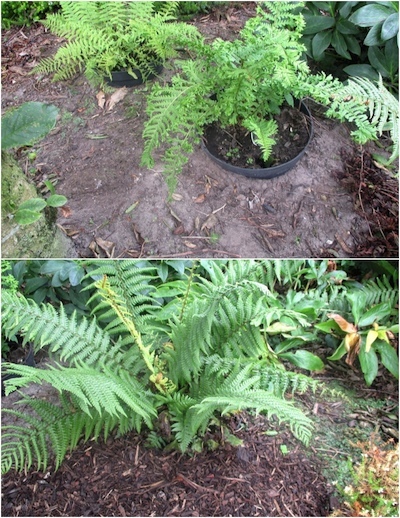 I have my own problems when I try to grow ferns on my hydrophobic sandy soil! I plunge ten litre pots to give me a watering lip. Do mulches such as wood chips deplete the soil of nitrogen? One might counter with the question, how could a layer at the surface do so? It can! Most of the decay of woody mulch is a result of fungal action. Fungus mycelium grows down into the soil to draw up nitrogen to maintain a suitable carbon/nitrogen ratio. The good news is that the nitrogen extraction is very small and for most practical purposes can be ignored. Not so if woody mulch is worked into the ground. If it is a problem it can be corrected by a light dressing of a nitrogen containing general fertiliser. Can fresh wood chips, bark or shreddings be used without composting? 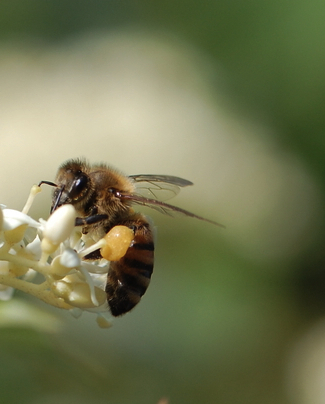 There might sometimes be slightly toxic content of fresh material that might damage very delicate plants. In practice with my well established sturdy perennial borders if I find an arboriculturist anxious to rid himself of a lorry load of his shreddings I ask him to dump them and I use them straight away. Is a gravel mulch suitable for herbaceous borders? This series started with my post on eliminating ground elder and nettles. Ever dreamed of impossible things before breakfast? Here are seven. Establish a grass ground cover by sowing and planting that is only fescue. This is my dream - no not a nightmare. I have already written four posts about it. Go to ‘Cathi’s grass verge’ in my theme column to follow Year 1 - or follow the links below! If you consider glyphosate the work of the devil read no further. Cathi’s verge is under a glyphosate maintenance regime. I am there with my knapsack sprayer to both eliminate the established weeds and spray any new ones as a regular routine - just like all my other gardens. 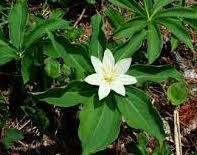 Whether a plant is a weed or a wanted plant will change as time passes and priorities move on. You can have too much of a good thing. You might have noticed that for me developing a garden feature sometimes takes a long time. My cemetery gardens took more than half a decade. Gardening by evolution, not revolution I call it. Cathi's verge will have been three years before it is something special and that won’t be the end. Brenda’s son Stephen would have moved house very much sooner! For a gardener like me who carries out any gardening task at ninety miles an hour my patience might seem strange. Even my no dig method in my vegetable garden takes few years for the best of its numerous benefits to shine through. As one who might advocate to a new gardener methods that give immediate returns to gain motivation I personally prefer the long term. I have when necessary made small garden features for clients in the proverbial day. At home a quick turn round time is not for me. 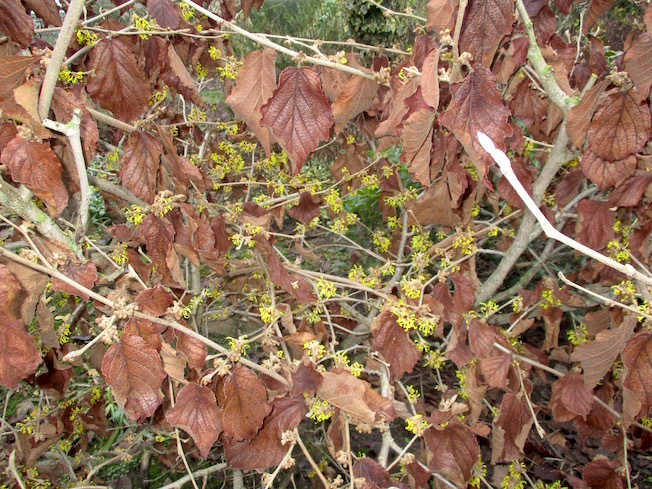 A patient approach is essential if a new garden contains established perennial weed. A dear lady showed me her very expensive perennial border overgrown with ground elder and couch grass. She asked me what she should do. I wanted to say “don’t start here’. I have enjoyed myself right from the very start of Cathi’s project. Pleasure for me comes from technical progress, making decisions, popping plants in and all the signs of beauty unfolding. For the first five months of Year 2 (2016) with the already established snowdrops - they have been there for years - and the succession of bulbs planted the previous Autumn the verge looked really quite lovely. In addition for the later part of the year without the messiness of cutting long grass back I have had a taste of the Summer and Autumn flowers I have planted. Last year’s small plants planted late 2015/early2016 will become something special this year 2017. As I write now in early January it looks nothing special. At this moment superficially half grass and half soil its just another scruffy mud splashed verge. The new feature carries an extremely low budget. Most of the plants are garnered from my garden. It has actually taken very little time measured in actual hours worked. Most of the time has been dreaming, planning and blogging about it! Planning is In my head not on paper and is made up as I go along! With my methods fashionable and normally necessary - but to me painful - reduction of soil fertility is not needed. 1. My first post in this series currently appears in my top ten hits and has been read to my amazement 35,000 times. Perhaps it is that the title includes ‘nettles’ which is such a common problem. In point of fact the nettles were well gone by the time the first season was over. 2. 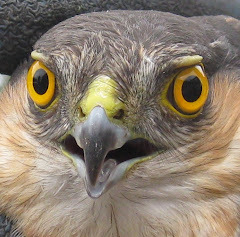 In my second post I followed the weed control to the end of the first season 2015. In the first year in addition to glyphosate I used MCPA which is known to give a relatively quick kill of nettles. I attempted a comparison of using just glyphosate with a glyphosate/MCPA combination and at the end of the season I could discern no difference. Since then I have abandoned any variation of treatment and just use minor modifications of the routine glyphosate spraying I normally do. 3. In a later post I introduced the heretical notion that I was going to start planting before completely eliminating the ground elder. 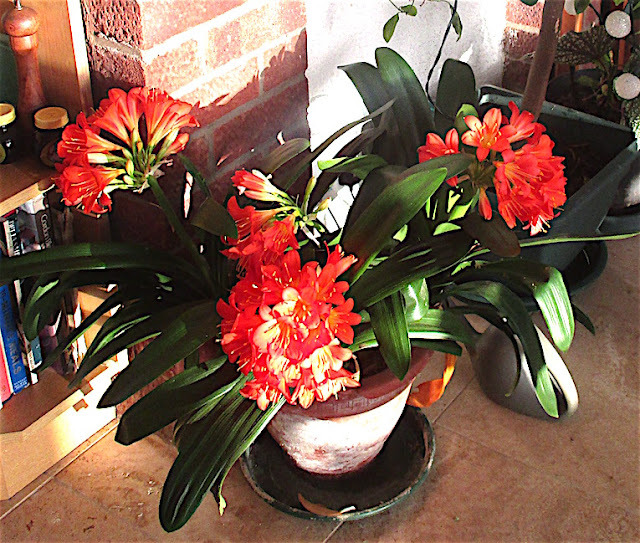 Maintenance would be made easier if I limited my planting to bulbs and other upright monocotyledons - but not exclusively so. I think it was here that I mentioned that at least for the next two seasons the pretty June carpets of dandelions and buttercups albeit restricted would be allowed to continue close to the road. 4. My last post was more a statement of ambition and detailed my previous experience with growing fescue grass as a plant in my other gardens and included pictures of the monocotyledon plants I had then started planting. I have now sourced seed of pure Chewings fescue. To me it is a beautiful none creeping grass. At the present time these two posts have yet to be published (one is written and I have all the pictures). 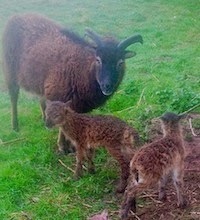 These will have appeared by early Summer and the first will be next month. I will insert the links on publication. Although I am confident my methods work for me - I have used them before but not altogether - I think I ought to give you a warning. I don’t expect many of you will attempt all those ‘impossible’ things I listed in my preamble today! I would like to encourage gardeners to think ‘out of the box’ but unless you are very experienced in chemical weed control following me too ambitiously or perhaps imprecisely might lead to disaster! In particular it needs to be emphasised that to completely eliminate ground elder using glyphosate takes repeated applications over three years. It is somewhat irresponsible of me to tell you that I am planting certain plants before it is gone. When roots of ground elder infiltrate the root mass of most conventional herbaceous perennials all is lost for permanent elimination unless you are highly skilled with a sprayer. For most gardeners the only resource is to lift the perennial when dormant and to divide the perennial into small enough pieces to remove by hand every single ground elder root - even washing roots away! Effectively you are re-propagating your herbaceous plant by division. My anticipated complete control of ground elder is only possible because of the upright nature of the monocotyledon plants I have chosen, my plant placement, and that surviving ground elder has not been chopped to small pieces by attempted physical removal. I am prepared to invoke ‘force majeur’ and sacrifice the occasional plant - but it has not happened yet.